WASHINGTON – The United States Mint (Mint) will open sales for the 2018 America the Beautiful Five Ounce Silver Uncirculated Coin – Pictured Rocks National Lakeshore (product code 18AJ) on February 9 at noon Eastern Time (ET). Struck in .999 fine silver at the Philadelphia Mint, the America the Beautiful Five Ounce Silver Uncirculated Coins are unique in that they measure three inches in diameter. The designs featured on these coins replicate their America the Beautiful Quarters® Program Coin counterparts. The reverse (tails) of the coin depicts Chapel Rock and the white pine tree that grows atop. Inscriptions include “PICTURED ROCKS,” “MICHIGAN,” “2018,” and “E PLURIBUS UNUM.” The obverse (heads) features a 1932 restored portrait of George Washington. Each legal tender coin is encapsulated and placed in an attractive presentation case with a Certificate of Authenticity. The America the Beautiful Five Ounce Silver Uncirculated Coin – Pictured Rocks National Lakeshore is priced at $154.95. Orders will be accepted at catalog.usmint.gov and at 1-800-USA-MINT (872-6468). Hearing- and speech-impaired customers with TTY equipment may order by calling 1-888-321-MINT (6468). Information on shipping options is available at catalog.usmint.gov/customer-service/shipping.html. This product will also be available for purchase through the Mint’s Product Enrollment Program. Details about the program are available at catalog.usmint.gov/shop/product-enrollments/. 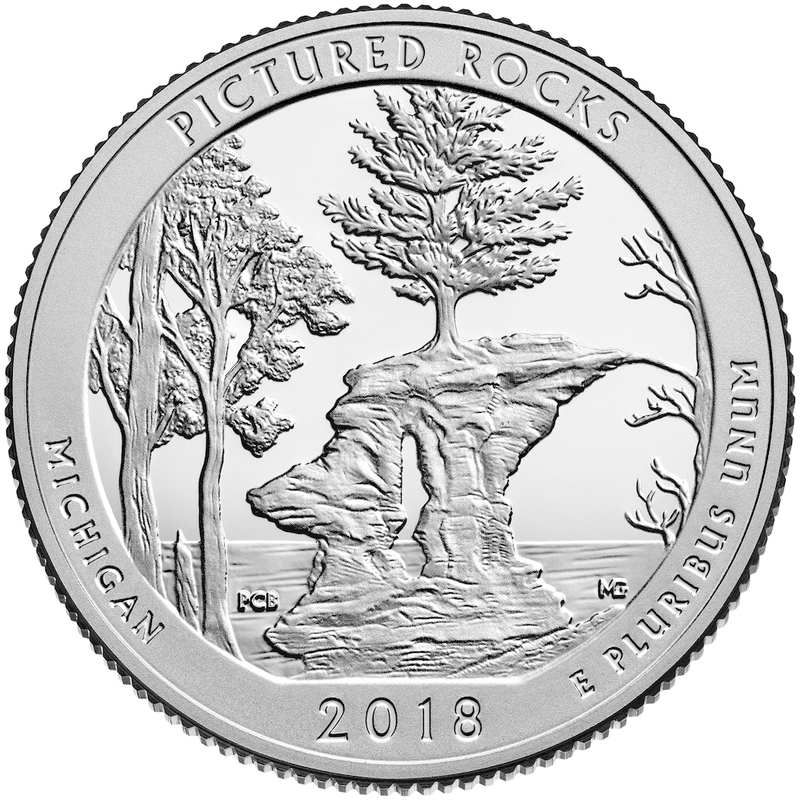 The current authorized mintage limit for both numismatic and bullion 2018 America the Beautiful Five Ounce Silver Coins honoring Pictured Rocks National Lakeshore is 100,000 units. The maximum potential mintage limit for the America the Beautiful Five Ounce Silver Uncirculated Coin-Pictured Rocks National Lakeshore has been set at 20,000 units.